Both window tinting and blinds are an excellent way to block sunlight and add privacy to your home. When you’re considering either option, you’ll need to understand the differences between each. Here, the tint experts at Pro-Tint in Lincoln, NE, share some information to help with your planning. 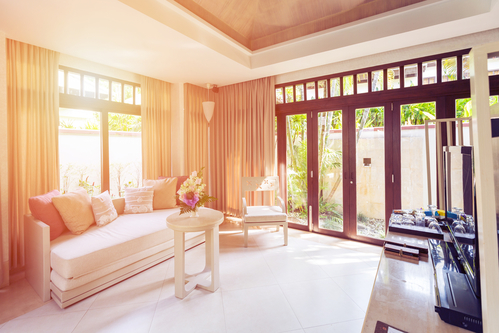 Window Tinting or Window Treatments: Which Are Right for You? Window treatments are an accessory installed in front of or behind a window. Blinds are a type of window treatment that reduces light and glare from the sun; however, they do not block solar heat. In fact, they capture the heat and expel it back into the room. They do not block UV rays, nor do they prevent fading. Drapes and curtains are another common window treatment. While they create privacy and block incoming light, they do not prevent heat transfer, and they're also prone to fading. Window tinting, applied directly to the surface of the window, blocks as much as 99% of UV rays from entering the room. With tint, you won’t suffer from the heat coming through the window, nor will your furniture and floors fade. Imagine having a full view of the outdoors without blocking the window with drapes or curtains. Not only is tinting functional, but it is also versatile. There are decorative tint options that can blend in and even enhance the decor in your home. When it comes to installation, window tint is a breeze. It is applied directly to the window and can be easily removed in the future. Although there are pros and cons to each, window tinting offers advantages that you won’t get with standard window treatments. To explore window tinting options for your home, turn to Pro-Tint. They provide top-notch tint installation with the highest level of professionalism and customer service. Call them at (402) 474-1234 or visit their website for more information.